ST. GEORGE — Triple digit temperatures can be a canine killer. Taking extra precautions with pets during the summer can help man’s best friend stay cool while balancing recreation with safety. Asphalt can burn paw pads, shadeless yards can cause heat stroke, and hot cars can kill pets – this is serious business for dogs. The summer months can be wonderful for many, but can also be dangerous for dogs, and even more treacherous for their feet. Paw pads can be easily burned by hot pavement, sidewalks and even sand. Feet are important, and aside from getting the dog from one place to another, dogs breathe through their feet. Additionally, the area in between the pads of the feet help the animal to cool down, regulating their body temperature. Asphalt, concrete, and other surfaces absorb enough heat to injure the extra thick flesh on a dog’s paw, and if it is too hot for human feet then it’s too hot for a dog’s paws, particularly if the dog has been in the water as the paw pads soften – making them more vulnerable to heat. Mike Mueller, owner of Red Rock Mechanical, recently showed how hot asphalt can get by using an infrared thermometer to detect the temperature in the parking lot. The thermometer showed a reading of 132 degrees, however that was under overcast skies and out of direct sunlight. “Depending on the sun and the time of the day, I’ve seen upwards of 185 degrees on the asphalt,” Mueller said. Prolonged contact with hot pavement and concrete is dangerous for dogs and should be avoided, as the damage can be so severe that the foot pads themselves can come off the animal’s feet. Such an injury is extremely painful for the dog and takes a long time to heal. Taking the dog on frequent walks on the pavement during cool times of day will help toughen the animal’s paw pads by promoting the formation of callus. This makes the skin of the dog’s foot pads thicker and less prone to injuries like burns and cuts. Dogs that seldom walk on pavement also require more frequent nail clippings, as walking on pavement files the dog’s nails. 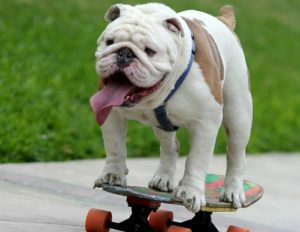 Experts remind pet owners to walk dogs in the early morning or evening to avoid paw pad burns and to walk dogs on grass, which remains cooler than the sidewalk. 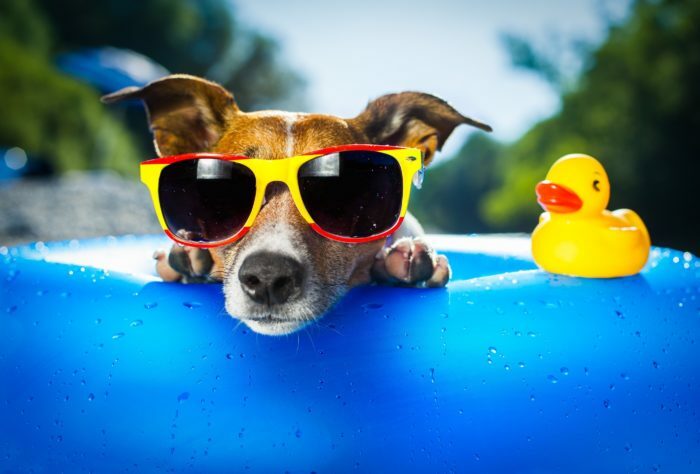 Animals are very sensitive to high temperatures, which means it’s critically important to monitor pets and provide them with plenty of shade and water. Additionally, a dog’s body is shorter and much closer to the ground, making them even more vulnerable to searing temperatures. All-day shade is one of the most important things to make sure your backyard has for your pet, according to the Humane Society of the United States. Anytime the animal is outside it needs protection from the heat and plenty of fresh, cold water. Adding ice during heat waves can help, along with tree shade. Tarps are ideal for providing shade for dogs since they don’t restrict air flow. A doghouse, however, does not provide relief from heat — in fact, it makes it worse. Every year, dogs suffer and die when their owners leave them in a parked car, which are deathtraps for dogs. On a 90-degree day, the interior temperature can reach as high as 160 degrees in less than 10 minutes, according to information provided by PETA, or People for the Ethical Treatment of Animals. Animals can sustain brain damage or even die from heatstroke in just 15 minutes. Beating the heat is extra tough for dogs because they can only cool themselves by sweating through their paw pads and panting. The hotter it is, the more furiously dogs pant, but any relief they gain comes at the cost of body fluid and dehydration in extreme heat. Leaving pets at home where they will be more comfortable is much safer for the animal, McManus said, particularly when it’s very hot outside. Animals are at particular risk for heat stroke if they are very old, very young, overweight, not conditioned to prolonged exercise, or have heart or respiratory disease. If your dog is experiencing any of these symptoms, put them in the shade immediately, grab cold water and wet towels and cool the dog down as quickly as possible, and call the pet’s veterinarian for added safety. Image you are a dog for a minute. First go put on long jeans a coat, hat and gloves (to simulate fur). Then go outside in bare feet and walk around the block once or twice. If you are not enjoying that your dog isn’t either.